Artist Rubina De Souza and her partner artists in Artists for a Cause, are a happy reminder that where there is compassion, there is hope, and where there are artists, truth and reason make their appearance, acting as a conscience for the people. 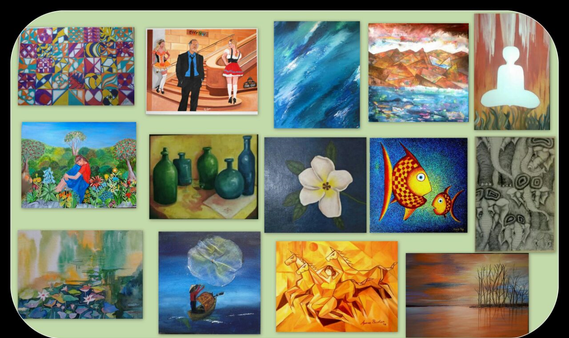 Artists for a Cause was started by Rubina De Souza with about 10-12 other artists in 2013. Since then the group has had four exhibitions with the aim of providing funds to give education to underprivileged children and youth in rural areas. 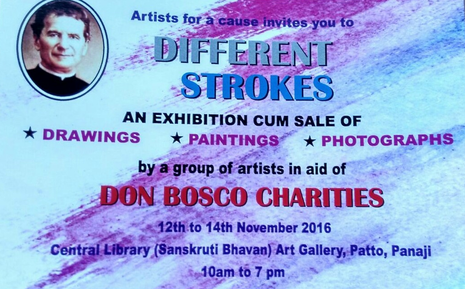 Working in tandem with Don Bosco charities, the artists hope to provide this essential resource of education to bring value and a sense of purpose to the lives of these young ones. This year over 30 artists will be exhibiting works that will be sold to favour the Don Bosco charities with the resulting income. Clarice Vaz is one of the artists presenting at Different Strokes. She says, ‘I was part of their exhibition last year as well and my artwork was bought by Mrs Alina Saldanha.’ Clarice, who specialises in painting in unique styles which include spin painting and fluid painting, will be presenting her syringe paintings at the exhibition. One of her works Fish Dialogue is representative of the sorry state we humans have reduced ourselves to despite having the capacity to manipulate nature. We have been seduced by our own vanity and greed. But instead of succumbing to a state where the big fish eat the small fish, a heartless, cruel reality of our times, we still have the chance to turn our lives around by embracing tolerance and compassion, and espousing them to progress. Stacy Rodrigues, Goa’s only visually impaired artist, will be showing as well. She says of her decision to participate in the show, ‘I’m getting a chance to contribute to help people in need, and I’ll be getting to meet a lot of people. 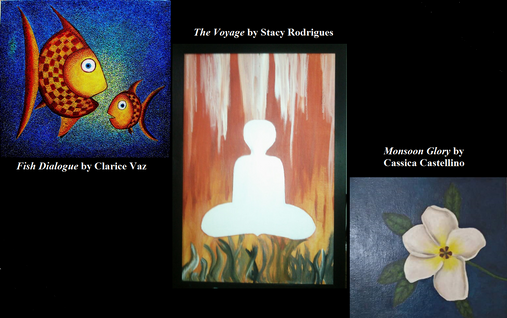 My main reason, however, is to contribute.’ Stacy will have 5-6 paintings on display: The Voyage, Together, A Monsoon Visitor and Incomplete are some of them. Emerging artist Cassica Castellino is a first time participant who was invited to join in by Clarice Vaz. She has her painting Monsoon Glory in the exhibition. She describes her work as creative, figurative and realistic. With a BA in Fine Arts, Cassica gives one on one art classes which she believes are far more effective than teaching a classful of children. Salvador Fernandes, Dr Aparna Pradhan, Dr Anthony Gomes, Damodar Madgaonkar, Uday Agarwal, Fr Royston DSouza SDB, Shailesh Dabholkar, Nandini Raikar, Jyoti Mehta, Lorraine Pereira, Karen Pereira, Stephanie DSousa, Anita Kubal, Aaron Gomes, Sherwyn Pereira, Sunil Shirodkar, Abeline Fernandes, Avito Dcosta, Genevieve DSouza, Akshatha Vinay, Vaishnavi Shankhwalkar, Vatsala Kamat Hede, Vasant Hede, Shyamsundar Narvekar and Rubina Dsouza are some of the artists on display from the 12th to the 14th at Sanskruti Bhavan, the Central Library, Patto, Panaji. Come and make a contribution and add value to the lives of children lacking the means to a better future.